Welcome to My Beginner’s Guide to Saving! My goal for this series is to guide you through a series of assignments intended to put you on sounder financial footing. Basically it is eight weeks to a better budget. Being that you are reading this, you are starting a lifestyle to a better you, and better financial situation. Saving is not easy. We live in a crazy consumer driven “have to have it” society, where the latest electronics, cars, fashions and cars are constantly being promoted; and we are made to feel like we’re missing out if we don’t have the latest or the best. The sheer quantity of stuff available to purchase at any given time is pretty much a bottomless pit. There is always more, more more! So we want and spend more, more, more! At least in theory it is simple……. Our reasons for spending money on stuff we don’t need are plentiful and varied. It makes us feel good. We want to look better. We want our house to be pretty. We want what everyone else has. It’s fun. We’re bored. We’re lonely. We want people to like us better. We want to be “ahead of the curve.” We’re “tech junkies”. We can’t pass up a “good deal.” We think we might need it someday. The sales pitch worked. We’re stressed. We’re trying to fill a void. It was on sale. We’re addicted to Starbucks, tobacco, scrapbooking, shoes, video games, books, fun, etc. The truth is that whatever the reason, much of what we spend our money on is unnecessary, a want rather than a need. I need to eat, but I want to drink my Keurig K-Cups coffee every day. I need to wear shoes, but I want to have dozens of pairs in every color and style imaginable. I want to get my hair done, but I have student loans and bills I need to pay. I want to take dance classes, but I need to pay for health insurance every month (why is insurance so much anyways?…347.00 a month!) 😦 So much for AFFORDABLE in Affordable Care Act. It is so very important to realize the distinction between what we think we need and what we actually need. 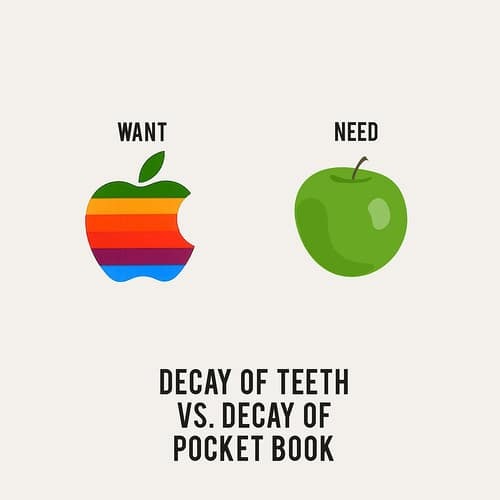 But its not an issue of wants Vs. needs, but wants Vs. Priorities. Don’t get me wrong, I’m not saying you should never spend money on anything, and live an austere and boring life, void of pretty things, entertainment or yummy coffee drinks. Try to go these next seven days without spending money on anything except what is absolutely necessary, as in matter-of-survival necessary. No clothes, no candy, no quick stops at McDonalds, no craft supplies, no nothing. Don’t worry, it’s only a week. You won’t die. I promise. It is a great way to get your budget back on track in a hurry! Don’t just make a mental list. Sit down and physically write down every single thing you can think of that you spend money on, from the mundane to the major. Read a few financial articles to get yourself motivated. It will give you something to do while you’re trying not to spend money. Think long and hard about the reasons you spend money frivelously. If you are using shopping as a way to fill a void in your life then you need to seriously explore other hobbies that don’t cost anything. Go to the library and check out some new books, make it your mission to explore every park in a 20 mile radius, set a goal of organizing every closet and cupboard in your house by the end of the summer, or better yet, have a yard sale and make some money off the things that you already have that you don’t need. And that’s it for this week! Stay tuned for another riveting installment next Sunday and remember, I want to hear from you! If you’ve decided to take this 8 week challenge, or if you have any ideas for fun free activities you’d like to share, please leave a comment below. Saving money is so much more fun when you have someone to share it with. I can’t wait to see what each week will bring. I read your articles every time you post, and I love everything you write about. I am ready to start budgeting and being that you are always so informative and knowledgeable, I know this will be great. Let the class begin! No matter how rich or poor, everyone should have a budget!! Thank you for the series Samantha. I will be reading every Sunday. OMG thee Yandy Smith-Harris??? It is such a great honor to not only have you follow me, but enjoy what I write about. You are an amazing mother, woman and professional, and I should be asking you the how too’s. I am more than glad to help you. Thank you for the compliments and motivation Mrs. Smith-Harris, because that is what they are to me. You are more than just someone one on Love and Hip Hop, you are a strong, intelligent, and beautiful woman who is a positive role model not just for myself, but for many girls across the nation. Much Obliged Samantha. Continue to bless the net with your soul and hard work babygirl!! Can you show us how to create an effective budget? That will help out alot.